Striking dark impression of the first edition JB Homann’s map of America, showing California as an Island on the second Sanson model and pre-datingHomann’s privilege. The Straits of Anian are shown forming a Northwest Passage between California and the mythical Terra Esonis, which forms a nearly continuous land bridge from the Northwest to Asia. The Pays de Moozemleck is shown east of the Straits of Anian. This landmark remains virtually unchanged through all of Homann’s maps of America, despite the transition to a peninsular California, resulting in an odd change from a coastal to an apparently landlocked position for this landmark. The Great Lakes are shown with some detail. 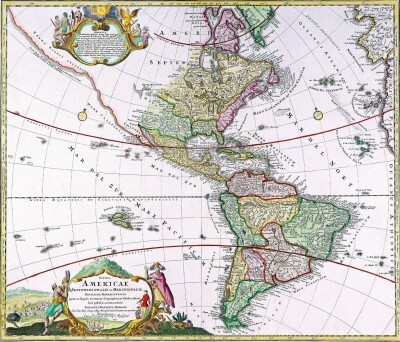 The Mississippi River shows the results of the early French Jesuit explorations, with its sources extending far North of the limits of the maps produced 20 and 30 years earlier, although Le Moyne’s mythical lake in the Southeastern US remains. 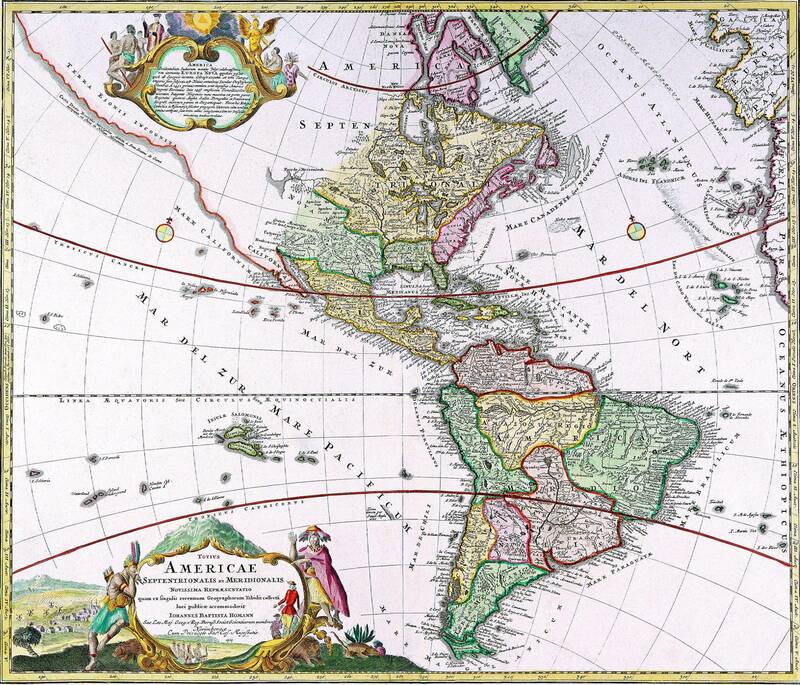 The title cartouche is based upon De Fer’s landmark map of 1699. The top cartouche is based upon De L’Isle’s 1703 map of Canada. Fine dark impression, reflecting a very early pull fom the copperplate. Condition Description: Old Color. Minor fold split at bottom centerfold and minor tear to the left of the fold, repaired on verso.